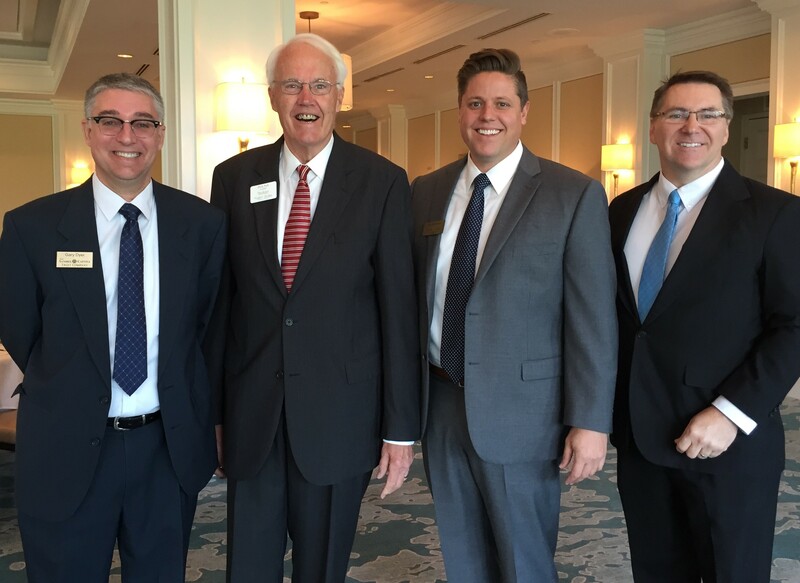 The Sanibel Captiva Trust Company recently hosted their Annual Economic Outlook program to more than 130 guests at The Sanctuary Golf Club. Senior Portfolio Manager Gary Dyer, CFA joined Chief Investment Officer, Ian Breusch, CFA in dissecting last year’s investment and economic activity, and addressed how to approach investing in 2019. How did your journey to The Sanibel Captiva Trust Company start? I was at Winslow Capital Management in Minnesota. I was one of three founders in 1992 and also served as one of the portfolio manager/analysts. Clark Winslow was with Alliance Bernstein when he asked me to join him in this venture. When I left there in 2003, it was at $1 billion AUM. Nuveen purchased them in 2008 and today they have $40 billion AUM. I brought Winslow’s investment philosophy and process to The Sanibel Captiva Trust Company. It’s very disciplined and it works. As for how we ended up here, we were very familiar and comfortable with this community, having bought a home in Captiva in 1998. We often came down for family vacations and such. In 2001, when The Trust Company was founded, we began to receive some promotional materials about the firm in our mail here. I saw it was founded by Al Hanser and I was very familiar with Al’s reputation in the industry, since he was at Resource Trust in Minnesota while I had my career up there. We lived very parallel lives and had mutual friends but had never actually met. I thought that Al would one day need a Chief Investment Officer for the firm and Nathalie and I flirted with relocating now that the kids were grown. She encouraged me to contact Al in February of 2003, so I emailed him and introduced myself. Al and Chip Lesch had just begun a search for an investment professional. I met with Al and the process took on a life of its own. I started work in April here on Sanibel. At that time, we had one office in Sanibel with $59 million AUM and between 30 – 40 families. It’s amazing to know we have reached $2 billion AUM and more than 370 families from Tampa Bay to Marco Island. What were you responsible for at that foundational level? I built out the investment team. Senior Portfolio Manager and Director of Research, Tim Vick was already working for us up in Chicago. I established protocol on how our firm determines its investment philosophy and process. Our motto was “keep it simple” so clients understand what they own and why. What impressed you about the company? The culture was evident. Terry and Al are solid leaders. Al knows his own strengths and weaknesses and lets people run with their skill sets. They were acquiring a Fortune 500 employee pool, most of whom had come from large national firms with vast backgrounds. What do you see as The Trust Company’s differentiators? We are investment managers with trust services. I like that. Florida regulators are very sharp and thorough – tougher than the federal Securities and Exchange Commission. The state regulators hold us to a higher standard and being a trust company was helpful, since as a fiduciary we are required to be protective of our clients’ assets. We have no mutual funds. Just individual securities. Because of this, we can help clients see the effects of their investment choices within their portfolios and understand how it got there. The Trust Company has a “point of view.” We understand that a 10% return over time requires a company to grow at 10%. Most money managers don’t express that to their clients. We build portfolios that meet the client’s risk tolerance and growth objective at a reasonable price. Overall, our 16-year investment history applying this investment philosophy and process has been very successful. How do you feel about our investment team’s ability to manage our portfolios and keep us on track going forward? I have a high degree of confidence that our Investment team has the wisdom and clear vision to carry the firm down this well-defined path for the benefit of our clients, employees and shareholders. Also, as part of our succession plan, we’ve been very thoughtful in building a team that assures we will have the necessary talent available for our clients. Gary Dyer, CFA joined our investment management team over the summer and has more than 25 years of wealth management experience. We’ll be making some other strategic hires in the near future as well. Of course, Al Hanser, our founder and chairman will serve as president beginning March 1. Given the recent market volatility, any concerns about a recession in 2019? A correction was anticipated but we’re weathering it. Our bogey is our clients’ return expectations and if we meet those– we’ve done our job. I have a favorite bit of advice always– “Cash and Courage.” Have courage to weather the tough times and enough cash to see you through it. What are your favorite things about The Trust Company? I’ve watched this company grow and it’s been both exciting and rewarding. I’m encouraged and reassured by the strength of the company. It has a wonderful corporate culture and I’m very excited about the open-ended opportunity as it grows. We take care of our clients and that is demonstrated by the extremely low turnover in relationships. You plan to stay in Sanibel-Captiva. What are some of your favorite things about this community? The relaxed attitudes are a pleasure and our residents’ commitment to the environment and wildlife. Everyone on the islands has a fascinating story, and I really enjoy asking them about their lives. I’ll have time to do a lot more of that now. Pyle retires at the end of February, with the respect and gratitude of The Sanibel Captiva Trust Company and holding company, SanCap Group Inc.